Q. How do you write a Q & A on Israel’s elections that is topical and up to date when the pace and nature of events are dynamic and their focus has briefly moved to Washington? A. At the time of writing this Q & A, PM Netanyahu and his chief electoral challenger Benny Gantz are in Washington. 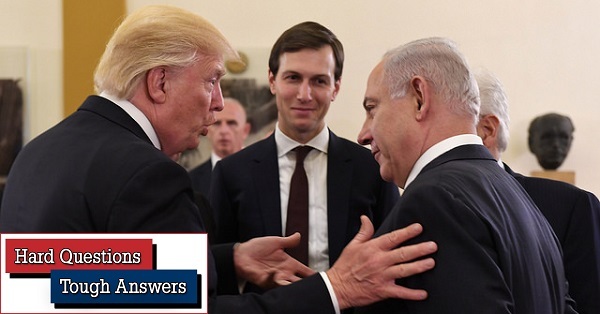 President Trump, freshly “exonerated” by the Mueller investigation, has personally recognized Israeli sovereignty over the Golan Heights and may be preparing to offer Netanyahu more goodies like permission for Jonathan Pollard to come to Israel. Netanyahu, behind in the polls and vulnerable to accusations of corruption regarding the holy of holies, Israel’s submarine-based second-strike capability, took an extraordinary step on his way (literally) to the plane taking him to Washington Saturday evening. He dropped by for an interview at the TV Channel 12 studios whose liberal journalists he had studiously boycotted for four years. Within two days he had taken the less unusual step of cutting short his US visit because of a rocket attack from Gaza. Early on Monday morning a Hamas rocket launched from Gaza landed 80 km. (50 miles) away on a house in a moshav in the Sharon area of central Israel. The house was destroyed; its residents, miraculously, were not critically injured. Had all seven of them been killed (a warning siren saved them), Israel would already have been at war with Gaza and the entire election picture would have changed. We still have more than two weeks for something like that to happen. With the end-March one-year anniversary of Gaza’s fence protests upon us, and bearing in mind that Hamas apparently believes Israel can be pressured by force for concessions at election time, Netanyahu’s abrupt return to Israel could signal precisely such a development. Netanyahu was preparing to shine in Washington, at AIPAC and the White House. He feels totally at home and welcome in both environments. Gantz, by way of contrast, is solid but pale and humdrum. As a freshman Israeli politician addressing American Jewish leaders, his challenge is how to avoid looking like a fish out of water. Trump’s words, gestures and hospitality will help Netanyahu’s electoral chances barely two weeks before Israelis go to the polls on April 9. Barring totally unpredictable circumstances, Netanyahu will have won this abbreviated round in Washington and improved his electoral chances precisely by abandoning the US arena to Gantz. In any case, both Israelis had arrived in the midst of a media frenzy over the Mueller Report that rendered them at best negligible news items. Q. In this uncertain atmosphere, there are two concrete issues we can address here. First, the US and the Golan. Trump tweeted a few days ago that it was “time for the US to fully recognize Israeli sovereignty over the Golan Heights”. On Monday he was scheduled to sign a White House decree to this effect. What does this mean for Netanyahu, for Israel and for the Middle East? A. Israel conquered the Golan Heights from Syria in the 1967 Six-Day War in what was generally deemed a legitimate act of self-defense. In 1981, the Begin government enacted legislation applying Israeli law to the Golan. That act, notably, stopped just short of annexation, drew worldwide condemnation, but still did not give Israel ownership over the Heights, which under international law remain sovereign Syrian territory occupied by Israel. The State Department’s recent designation of the Heights as “Israeli-controlled” rather than “occupied” did not change this status. Nor does Trump’s declaration. Supported by Secretary of State Pompeo’s statement that it is possible that Trump was sent by God to save Israel from Iran, which threatens Israel from Syrian territory, Trump’s unilateral awarding of sovereignty undoubtedly offers some emotional and nationalistic satisfaction to many Israelis. This in turn could perhaps boost Netanyahu’s popularity on election eve. But nothing beyond that. In order to render all or part of the Golan sovereign Israeli territory, Israel and Syria have to agree on the transfer of sovereignty and the United Nations has to recognize this act. The ultimate sovereign disposition of the Golan was the subject of serious negotiations between Jerusalem and Damascus for many years prior to the outbreak of revolution and chaos in Syria in 2011. Most recently, Netanyahu’s own government engaged in talks with Syria in 2009-2010, with US mediation. From what we know of all these talks, first with Hafez Assad and then with his son Bashar, had they been concluded successfully they would have returned sovereignty over virtually the entire Golan to Syria--in return for peace and security commitments--rather than rewarding it to Israel. In recent years, a number of developments have caused most Israelis, including many who once favored a territories-for-peace deal with Syria regarding the Golan, to breathe a sigh of relief that no agreement was ever reached with the Assads. Syria has disintegrated. Bashar Assad’s regime tortured and butchered hundreds of thousands of Syrians and sent millions into exile. And Iran, whose leaders regularly vow to destroy Israel, has sent its troops, weapons and proxies to Syria--some close to the Golan border. The Assads and Iran are dangerous neighbors. Imagine if Israel had returned the Golan to Syria in 2010 and Iranian forces were now deployed on the shores of the Sea of Galilee. No one elsewhere in the Arab world is demanding that Israel leave the Golan or even negotiate over it. Q. So Trump’s declaration is superfluous, not legally relevant and by its timing constitutes US interference in Israel’s election. What else is new? Where, at the strategic level, is the damage? A. The damage is potentially far-reaching. It focuses on US-Russian relations, US-Arab relations, and the prospects for peace in the Middle East. First, Russia. If Trump had any intention of actively challenging (beyond relatively ineffective economic sanctions) Russia’s 2014 annexation of Crimea, his recognition of Israeli annexation of the Golan destroys his case. After all, not so many decades ago Crimea really did belong to Russia rather than Ukraine. In contrast, Israelis have to go back around 2000 years to find anything approximating a sovereign Hebrew grip on the Golan. Trump, lest we forget, is withdrawing American troops from eastern Syria and wants to remove them from Afghanistan and elsewhere in the Middle East. He is, in effect, abandoning Syria to the Russians and the Iranians. In this regard, his crude unilateral recognition of Israeli sovereignty on the Golan is really a pathetic gesture to Israel. The Golan is yours, Trump is saying, and your defense of it (and all of Israel) against Iranian machinations is thoroughly legitimate in Washington’s eyes. But you’re on your own in dealing with Iran and Russia on Syrian soil. Next, Arab attitudes toward Washington. In Arab eyes, if Trump proclaims Israeli annexation of sovereign Arab territory, what affront will he condone next? Who in the Arab world can trust him? First he “gave” Israel Jerusalem (which under international law is still a corpus separatum as defined by the UN in 1947), and now the Golan? Bashar Assad, in particular, can find a silver lining in Trump’s decision to award Israel with Syrian territory that Israel in any case was destined to hold onto for a long time. Now Assad can divert regional and global attention away from his own atrocities to US-sanctioned Israeli “theft” of his land. And Iran and Hezbollah can claim international sanction for their “resistance” campaign against Israel. Then there are the Palestinians and the much-anticipated US “deal of the century” to settle their conflict with Israel and resolve the territorial disposition of the West Bank, Gaza Strip and Jerusalem. Palestinians were already predisposed to suspect Trump’s peace team of planning to “buy”, with Saudi-financed bribes, their acquiescence in huge territorial and sovereign concessions. What are they to think now? Indeed, given that Trump’s “deal” seems in any case likely to crash-land, many members of Netanyahu’s right nationalist-religious coalition will now understandably conclude from Trump’s Golan act that they can proceed, under tacit US approval, with the annexation of all or at least part of the West Bank. Some are already campaigning on that basis in the current elections. Q. So will Trump go down in history as one of the founding fathers of binational, apartheid Israel? Or did we get it wrong? Is he awarding Israel the Golan as an up-front quid pro quo for demanding, a few weeks from now, huge concessions from Netanyahu in his upcoming deal of the century? A. I don’t believe we got it wrong. But in any case, we’ll know in a few weeks. Q. What’s the second concrete election-related issue that will survive the tacit White House endorsement of Netanyahu this week? A. The Netanyahu-submarine scandal. Gantz and his Blue and White fellow former IDF chiefs of staff Yaalon and Ashkenazi have accused Netanyahu of approving, several years ago, the purchase from Germany of an expensive sixth missile-launching submarine that the security community assessed Israel did not need. They also accuse him of giving the green light to Germany to sell Egypt similar submarines. In both cases, Netanyahu’s decisions bypassed normal procedures that required the IDF chief of staff and the minister of defense to be consulted. On Saturday night, literally en route to the airport for his flight to the US, Netanyahu “crashed” a news broadcast on Israeli TV Channel 12, whose presenters had been unsuccessfully soliciting an interview for years. In other words, he wanted to address an audience he does not usually appeal to. The main topic was the submarines. Netanyahu tried to make the case that his decisions, particularly regarding the German submarine sale to Egypt, involved considerations so secret that he could not even share them with his own defense minister (who happened at the time to be Yaalon, then a Likudnik). But he did share them with his attorney general, then (as now) Avichai Mandelblit. To add to the confusion, it has emerged that Netanyahu had bought and sold, at a huge profit, stock in an American company owned by his cousin, that supplied equipment to the German submarine-manufacturer Thyssen-Krupp. Conflict of interest? Blatant breach of trust? All these submarine-related issues were the focus of the attorney general’s file 3000, an investigation in which Mandelblit had previously exonerated Netanyahu of involvement (unlike files 1,000, 2,000 and 4,000, where he has pressed criminal charges against Netanyahu). Now it emerges that the PM’s stock transactions and acts of unorthodox decision-making regarding submarine deals were not known to Mandelblit. File 3,000 has to be reopened. To anyone familiar with Israel’s security community, Netanyahu’s argument about secrets that his own security chiefs were prohibited from knowing was patently a fabrication. For his part, Mandelblit has denied that Netanyahu shared the “secret” with him. The prime minister’s last-minute decision to solicit an interview with the TV channel he detests but which has the highest viewer ratings can only be understood as a sign of panic and his remarks during the interview as a flimsy cover-up. A. Stay tuned. 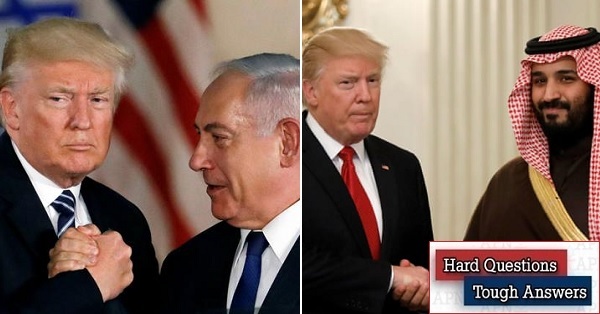 The two weeks that follow Netanyahu and Gantz’s return from Washington will decide whether the gratuitous boost the prime minister got from Trump (the Golan, perhaps Pollard) will be sufficient for him to navigate his way through scandals and hang onto the premiership. Meanwhile Netanyahu has to deal with Gaza. This is a virtual no-win situation. If Israel’s response is muffled, the prime minister/defense minister looks weak at a bad time. If he decides to escalate heavily against Hamas to prove to voters that he is tough on security, Israel will suffer losses while Hamas--which is not holding elections--will not “surrender” even if its losses are a thousand-fold greater. And remember: one decisive factor that has nothing to do with Trump, the Golan, Gaza and submarines will be the fate of four or five small right-oriented parties that may or may not survive the four-mandate electoral threshold. As matters stand, it is their electoral fate that will decide which side, Netanyahu or Gantz, emerges with a blocking majority of 61 members of Knesset.